When the Director of Amateur Scouting of an NHL club heads to the NHL Entry Draft in June, he hopes to accomplish something that weekend that is a lot rarer than people may think. Select a quality NHL player in the 1st round. Every round is important; the Detroit Red Wings are proof of that. Just look at perennial all-stars Pavel Datsyuk (selected in the 6th round, 171st overall, in the 1998 NHL Draft) and Henrik Zetterberg (selected in the 7th round, 210th overall, in the 1999 NHL Draft). However, the 1st round is where teams expect to succeed with their draft selections. These are the highly touted players; the ones that are expected to make the jump to the NHL faster than anyone else in the draft. Most importantly, these are the guys that are supposed to be the best players on your NHL roster for years to come. 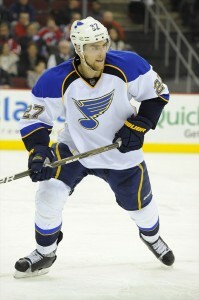 Currently, NHL scouts are drooling over what has happened this season with the St. Louis Blues. With Huskins and Russell on the IR, the Blues have been sending out five out of six defensemen who were 1st round draft selections. Not one other team in the NHL can make that claim. The smart drafting has led to a great product on the ice. The Blues have allowed 20-or-less shots against 14 times this season and have allowed 40-or-more shots against in just one game this season. This solid play has allowed for 12 shutouts this season (split between goaltenders Jaroslav Halak and Brian Elliott), and an average of just 1.87 goals-against-per-game. The stingy defense has allowed just 2.59 shots-against-per-game. All of these statistics lead the league in each category. How are they allowing so few shots-against on a nightly basis? The transition-game for St. Louis has been something to marvel. After the Blues block shots and passes in the slot, it is a common occurrence to see the three forwards along with one defenseman break up the ice. The four-man attack has led to various scoring chances for the Blues. Pietrangelo, in his second-full NHL season, finds himself tied for 5th in scoring by defensemen, posting 41 points. Shattenkirk is right behind him, tied for 14th with 36 points. Shattenkirk also ranks 5th among all NHL players with a plus-26 rating. The defense has also been solid when they are a man-down. Tuesday night’s 5-1 win over the division-rival Chicago Blackhawks was due in large part to the success of the penalty-kill. The Blues killed off all five Chicago power-plays and allowed just three shots in that time. Forward Vladimir Sobotka even added a shorthanded goal due to the penalty-kill squad’s unwillingness to let Chicago set-up with the extra man. The penalty-kill has not allowed a power-play goal since James Wisniewski’s late first period goal on Valentine’s Day. They have killed off 35 consecutive power-plays. The penalty-kill and overall outstanding defensive play has been the key to the Blues’ success this season. After Thursday’s win over the Ducks, the Blues find themselves atop the NHL standings. Bad years lead to higher 1st round picks and forces the hand of management to make trades. 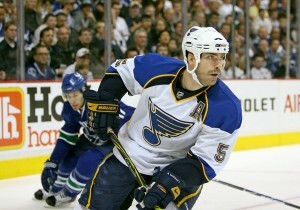 In the Blues’ case, these trades have only benefited the future of the franchise. The Blues’ road to success is exactly one that several NHL scouts will be trying to follow in this June’s draft.